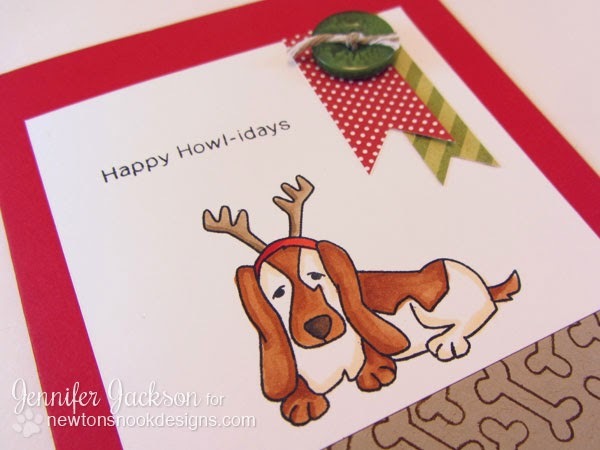 Today I'm featuring the Canine Christmas Stamp set! I realized that Christmas is FAST approaching and I haven't had a chance to share all my cards that I made using our Canine Christmas stamp set so I thought today would be a fun day to do just that! 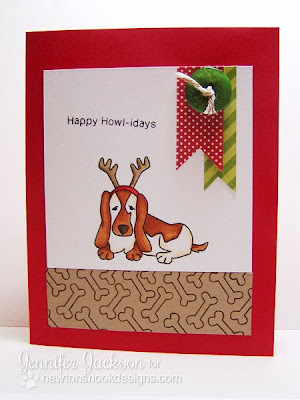 For the first card I chose the color the cute little basset hound stamp with my copic markers. Then I created a fun little strip of bones using brown ink on Kraft colored paper! Then to add a little fun pattern to the card I added some little flags from patterned paper and a button! Then I finished it off with the "Happy Howl-idays" sentiment! I love how the sentiment is so cheerful but the doggie looks a little bored. Reminds me a bit of eeyore... I picture him being annoyed that he's wearing those antlers! 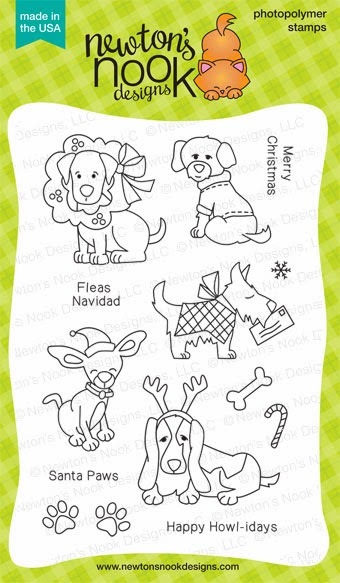 For the next card, I colored the little Chihuahua doggie in the santa hat and cut him out to make a big tag! I cut out a little circle from Kraft colored card stock and used it on the tag top for a bit of added interest - sort of like a packing tag. Then I created a simple background with two patterns - one is a candy stripe from some misc. patterned paper I had lying around and the other I created by stamping paws all over the card stock with brown ink. I love how you can use stamps to create your own background patterns! 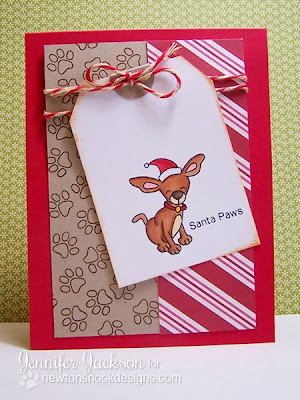 I also sponged the edges of the tag with some distress ink and then added it on with some fun kraft/red bakers twine. For this one I wanted to create a snowy scene for the puppy to sit in so I colored him on the white cardstock and then I paper pierced a sweater for him from a plaid paper scrap. Then I added some kraft colored snowflakes and a snowbank from a piece of torn cardstock. Then to balance out the colors I added some red polka dot paper and a piece of that kraft/red twine. Love how this one turned out! Just a few days until Christmas - do you have christmas cards done? I'm done with my shopping but still need to finish those cards up! I've been so busy blogging and designing for spring that I'm a bit behind! 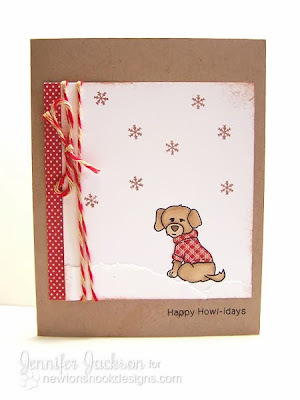 Cute dog cards..I only made a few handmade cards for family this year...all the rest were store bought..Horror right? HA! These are so darling! Christmas puppies, in your hands, bring a whole new meaning to darling and cute!! Way too cute for words!!!! 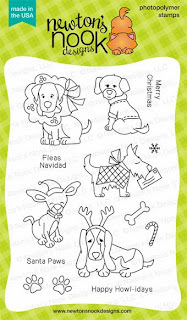 Oh what a darling set for us doggie people! Cute cards!